Getting a web presence for many could just be an obligation; for many others, it could be a means to supplement their marketing initiatives; for some to dispense information to their customers or stakeholders, but for Bloomberg, the New York-headquartered business news agency with a multi-national presence, it’s a way of making its both ends meet; it’s a way of making a difference to journalism. In the mobile-centric era, when most of the people think mobile apps have overtaken the web completely, or web is a thing of past, Bloomberg still finds its WordPress-powered website as its key to success. Here is an attempt to understand what attributes of the WordPress development framework are really making Bloomberg to thrive in the digital world. Powerful editor, easy-to-use media management tool, W3C compliant code generators draw in some capabilities that make WordPress development extremely relevant to what a media company like Bloomberg must get in place to manage, distribute and deliver content to the world. To work with a diverse range of raw information or content materials collected from 72 countries and through 146 news bureaus, Bloomberg has got a robust in-house team of 2, 300 internal employees. To streamline production and delivery, these people must collaborate well. Thankfully, WordPress makes it happen with ease. Its feature-rich user management dashboard allows the administrator to create users with solemn permissions to efficiently play their role in terms of content aggregation, creation, editing, proofreading, and publishing. It also provides support for user-generated content, thereby enabling the external users, sometimes, reporters, news agencies, and readers to contribute to the website. From phone, tablet, and laptop to desktop and wearable gadget, consumers are accessing content from all possible windows. 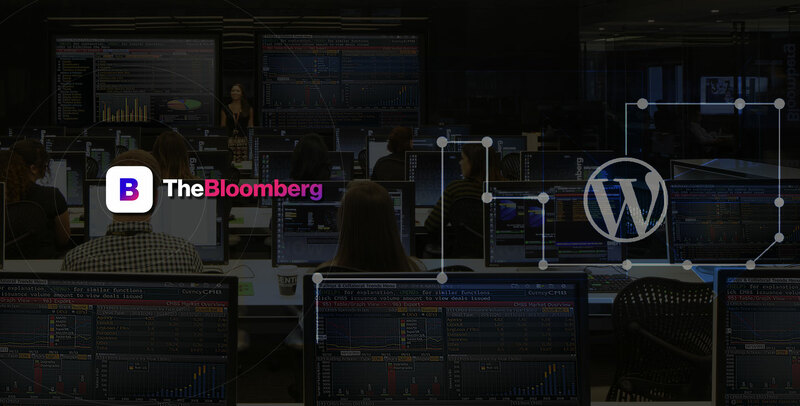 As the phenomenon goes global and pervasive, Bloomberg felt the need of a responsive yet full-featured website, and that got fulfilled by its WordPress developers. Cross-browser compatibility contributes a lot to the success of this website. It makes it really easier for Bloomberg to reach out to the audiences on different devices, irrespective of the browsers they use. It works even with outdated versions of browsers, though with some constraint. Operating a news website on a global level targeting multiple demographics and their audiences often demand adding new features and functionalities to the existing website. Some might argue that it shouldn't be a big deal for such a large media company. Obviously, from the monetary or technology investment angle, the argument has some ground to stand. However, making changes to the website on a frequent basis ropes in considerable performance and stability risks, which Bloomberg certainly will try to skip in the wake of the mammoth database that it holds, the large readership that it enjoys, and the bulk of revenue that it generates through advertisement. Plugins came as a silver lining to the media company. They enable its people, even the non-tech journalists, to enhance the website without courting any risks. There is a sea of plugins at the disposal of WordPress developers that helps with extending the capability of the website in terms of content management, user-engagement, publishing, and advertising. Plugins, as the name echoes can be added to a website on the plug-and-play basis. Anyone without technical know-how can add or remove complex galleries, social networking, forums, social media widgets, spam protection, calendars, and much more to the website. Though technology has blessed us to do more with less, at times, it does surprise and shock, and WordPress is no exception. In this regard, Bloomberg’s choice for a content management framework that has got a progressive community at its side seems a prudential decision. The knowledgeable community helps the news agency to overcome any vulnerabilities or challenges in a quick and easy manner. Being a popular open source content management system that powers over 10 million websites in the world, WordPress has got a large and growing supportive community. It has a dedicated official support forum where experienced developers and users share their expertise and problems, tutorials and blog sections discussing trends and insights based on user experience, security, performance and other aspects. In addition, the community does organizes a seminar or congregation, named as WordCamp or Meetup to discuss new challenges and possibilities. Mobile web Vs app. Actually, there is no such battle in the digital space. All that matter is how intelligently media companies or any other businesses are making use of both. In addition, technology investment should be done wisely, it should not just serve the current requirements, but also be prepared or flexible to cope with the emerging ones. September 12 2018How Augmented Reality Is Transforming The E-commerce Industry? Node.Js For Web Application Development - Pros & Cons!